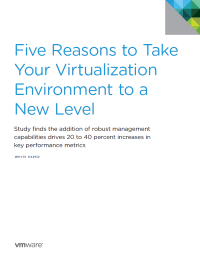 Download this white paper to learn how vSphere with Operations Management helps you identify problems and proactively address issues before they affect your end users. In order to reach your peak IT performance and intelligently scale your virtual environment, you need complementary tools to manage your entire virtual environment from a single console. Cutting costs, an improved capacity utilization and a strong ROI are only some of the benefits brought to enterprises from adding vRealize Operations management capabilities to a vSphere environment.